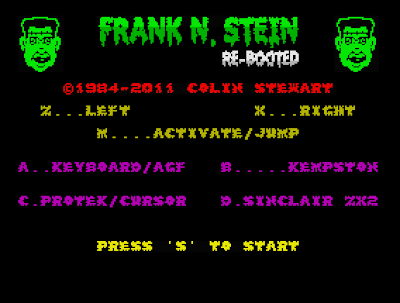 Upon loading this 'Re-booted' edition of Frank 'n' Stein, little initially seems to have changed. It may have a (much better) loading screen, the vu-meter timer has been replaced by a digital timer and the eagle-eyed might spot differences in animation, but generally Stage 1 feels the same. Stage 2 however is a different kettle of fish – whereas the even numbered stages previously involved a climb from the bottom of the screen to the top of the screen with easy-to-avoid barrels being thrown, in the re-boot the even numbered levels become much more 'Donkey Kong' like. Primarily this is due to the Professor gaining the ability to jump! On the odd numbered levels the Prof returns to his collect-em-up shenanigans and ignores his new found jumping skills. Games don't need to have an internal logic, do they? Despite the schizophrenic nature of the game (effectively the player swaps between levels which now have two even-more-distinct game styles) it makes for a dramatic improvement over the old-fashioned version where the even numbered levels were much less satisfying. 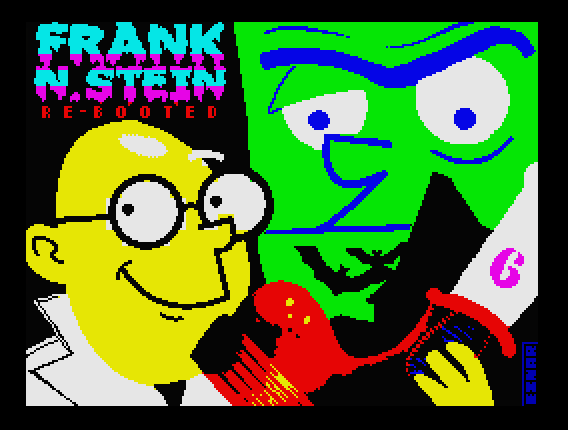 Overall, Frank'n'Stein is a better game for its Re-booting, and if you have not played the original then this new version is the one to play. However, be prepared to be repeatedly beaten – this game is hard, and the 27 years between releases have not tamed down the brutal difficulty in any way. Timing and planning to navigate levels are required (and I suspect that emulator quick-saves will be the order of the day to see the later levels). Fans of (more famous) single screen platform games such as Donkey Kong, Burger Time, Manic Miner, Chuckie Egg, Bounty Bob et al should definitely check this out. Colin Stewart, author of the original Frank'n'Stein and it's Re-Booted 2011 remix kindly took the time to answer some questions for RGCD regrading the monster he created. Firstly, could you take a moment to introduce yourself to RGCD readers who may not be familiar with your name. What seems like a lifetime ago, I created a humble little game for the 48K ZX Spectrum called "Frank N. Stein". I was only 17 at the time and created the whole thing in my bedroom with nothing but a Spectrum, a black & white TV and a cassette player. You have chosen to revisit Frank'n'stein 27 years (to the day) after it originally was released. Why now? Have you spent the intervening 27 years honing your programming skills? The main reason for the re-boot was an increase in interest for the game in the retro community. I was never really happy with the intermediate even levels, I always wanted them to be more “Donkey Kong” like. I also had 8 levels and some enemies that I didn't have room in for in the original build. It was obvious to me I had to do a rewrite and finally put things right. How many the changes you've made things you'd planned/wanted to do at the time but couldn't implement (perhaps through time restraints), and how many were things that you retrospectively thought of? Most of the changes I've made in the re-boot were meant to be there from the start, but time and memory constraints just didn't allow it. A couple of things I just changed to make it better. The new more accurate digital timer and the improved cleaner layout at the top, are examples. I was determined not to change the game-play, that's what most players liked about it. The original loading screen was created by the publisher PSS, I had nothing to do with it. The new loading screen is based on my box artwork which I created to better represent how I imagined Dr. Frank to look. Famously Frank'n'Stein was (at least partly) compiled using PSS's basic compiler (the code for which could be hacked out of the game and used. I was guilty of this). Can you describe the development process for the original - and this new version (which appears to my eye to contain more custom machine code). I started off writing the original game in machine code and sent off a prototype to PSS, they suggested using the BASIC complier to speed development up. So that's what I did, managing to complete the game in about 3 months. The new game is a complete rewrite, using my own machine code sprite engine and complied C. I've spent the last 27 years as a software engineer and I've used that design experience in the new version. It may look the same, but under the hood there are no similarities at all. Have you been following the Speccy development scene since the demise of the platform as a viable concern? What have you been playing? Any recommendations? To be honest I haven't been following the Speccy development scene, I just got drawn back in again by the enthusiasm of the retro community. I left the game scene, both developing and playing, shortly after Frank N. Stein when I got a real job and I just got back in a few months ago. So I guess my only recommendation is “Frank N. Stein Re-booted” ! What are you up to next? Can you reveal any sneaky details about your forthcoming Dracula game? Dracula is next. I have the original graphics, screen layouts and some simple game-play. Now I just have to finish it off. It's based in the house above the floor level you see in Frank N. Stein and there are powered lifts between the floors. The electric systems of Frank N. Stein also play a big but different part in Dracula, but you'll have to wait and see what I mean by that! It's great that there's a retro community that appreciate these games for what they are. Long after the Spectrum's demise, long may it's legacy survive. Thanks for taking the time to talk to me today, I've really enjoyed it.